As much as I want it to be "F15-Strike Eagle III - The Movie - The Game"... kconan and surplusguy are both partially right - it's A320 by Loriciels. My cousin had this on his Atari (520? ), but I doubt it survived long in his disk box. The only reason I guessed "A320 Airbus" was because it was one of the few flight sims from back in the day that I'm not aware of, and due its lame sounding "promotional tie-in" name. Is that the Ghostbusters logo on the car? The logo on the car is "88" with red and white colors. Hehe, did you just type in "examine door" - or does it have a more advanced parser? I Love Mark Lovegrove - Deluxe Edition? The Adventures of Suchy Chleb and Dla Konia: Gold Edition? 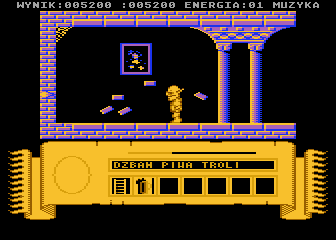 There's also a 1996 windows remake of this Atari 8-bit title. 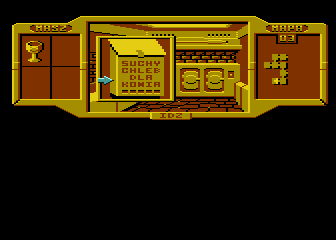 I can't believe I hadn't heard of it, as there weren't many adventure games for Atari 800/XL/XE. Maybe you know it by the title "Sexmisja"?